There’s a popular old song that includes the lyrics “you and me and the breeze”. It is apropos as the invitation to visit Mihama Dai-Ni Park, not too far from Camp Foster, where the sun and the sea and the breeze are what makes the idyllic little park such a great place to unwind. It’s not a big park, and there are no rest room facilities, but Mihama Dai-Ni offers something many say is more important. Tranquility. The greenery offers opportunities for calm, where visitors can rest or look out over the town. Benches are nestled under trees, and fresh breezes bring forth the season’s smells. 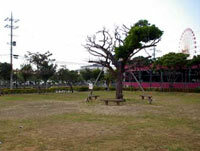 A visit to Mihama Dai-Ni Park is easy. Exit the Camp Foster Commissary Gate and head north on Highway 58 until reaching Hamby Town San-A supermarket. Make a left, then continue to the end of the street, where you must take a right turn in front of the Araha Beach traffic light. Once there, you will see a huge parking area. Pull in and park, get out, and walk across the street to the park.